While reading The Wall it was as if I was reading something that I had written, not someone else. It was the same feeling I often get when I've read a journal entry that I wrote years ago, familiar but at the same time it seems as though everything written in that journal happened to someone else. 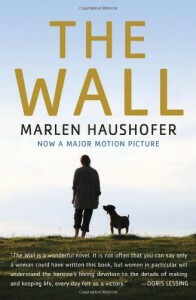 The first person narrative helps with fostering that type of connection between the character and the reader, but with this book it occurred to an extent which I had not experienced before. It was fascinating. I wasn't left wondering what I would have done differently had I been in this nameless woman's shoes, but rather I knew that I would have done just as she had done. The book concluded much as I expected it would, with no clear resolution and no answers. The Wall exists and this nameless woman is trapped within its confines. I do wonder if she tried to dig her way under but in a way I think I already know the answer to that question. There was no other way to end this book, there would be no happy endings. Even if she had managed to find her way to the other side of the Wall what was left for her there? Would she have even survived as she had on the inside? This book is brilliant, one of the best I've read in a very long time. It left me overwhelmed. I read it after seeing the trailer for the movie version and I can only hope that more people will read it too.